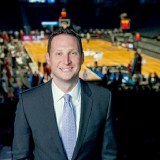 Brian Basloe is the SVP of Suite and Ticket Sales for Barclays Center and the Brooklyn Nets. Brian Basloe hasn’t been active on Medium yet. Check back later to see their stories, claps, and highlights.